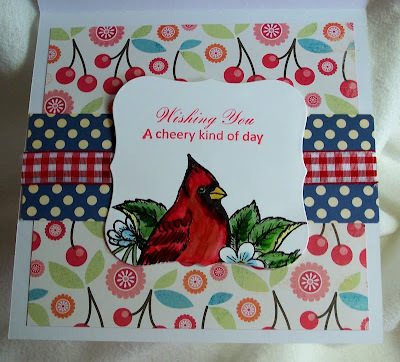 Sue's Rubber Stamping Adventures: BSS MONDAY iDEA - LET'S MIX IT UP !! Do you always make your project or card with coordinating colors and papers? Today, I thought we would have a go at mixing up papers and colors that are pleasing and interesting to the eye. 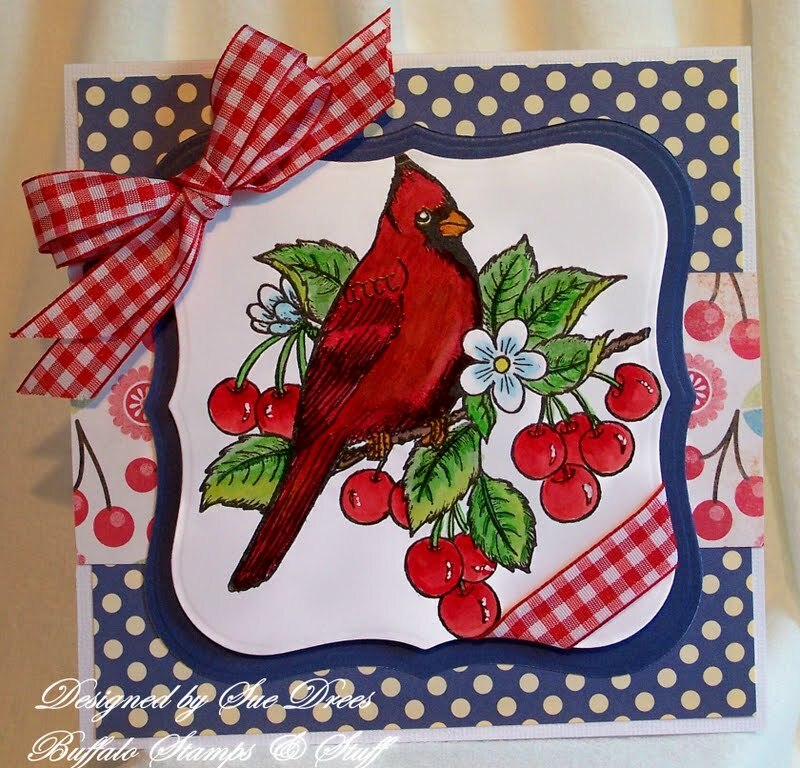 I stamped and colored this beautiful Cardinal and cherries on white smooth card stock. I cut it out using a Labels 4 die from Spellbinders. I decided to leave the edges and background white so I could use different papers and ribbon. The mat is a dark, almost Navy Blue textured card stock on a white textured card stock base. The polka dot background paper is October Afternoon, 5 & Dime Stack. Then I added some print paper across the middle with cherries on it, by My Mind's Eye, Fine and Dandy, and finally, the red gingham ribbon and bow were added. I popped up the image so it stood out on the card. Colored with Copics. For the inside, I used the cherry paper as the background, a strip of the polka dot paper and a strip of the gingham ribbon across the middle. I stamped part of the image on a smaller label 4 die along with the sentiment which was included in the set. Hope you try to "mix it up" on a project or card soon. Red, White, and Blue; one of my favorite color combinations. Beautiful card. Well done for sure on the bird image. Bright and "cherry" for a summer day. Definitely will cheer someone up. Those colors just popped and caught my eye. 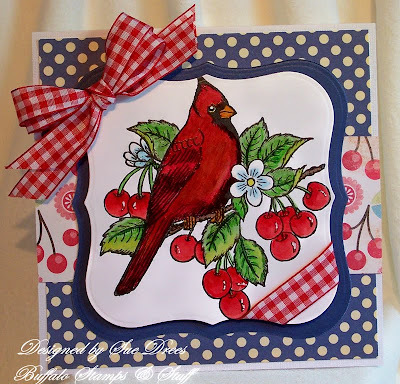 gorgeous stamp and card sue. 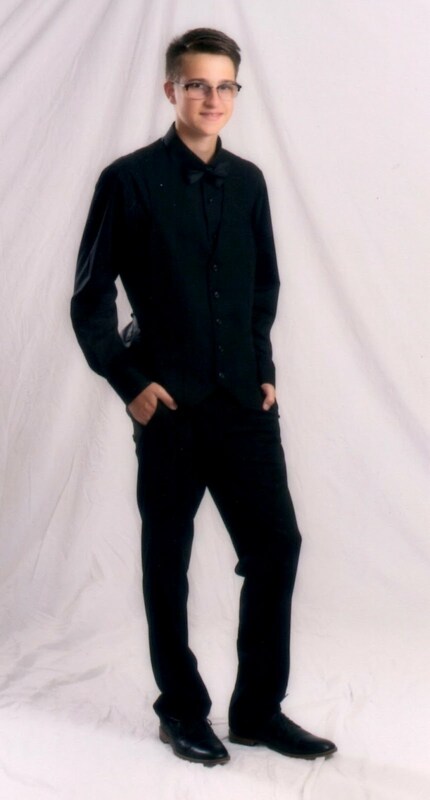 Oh such a gorgeous image!! Love your mixture of ribbons and colors here! !